CONGRATS to this month's Spectrum Super Star! We are happy to recognize Kathy Bozard as our December 2017 Spectrum Super Star of the month! Kathy Bozard has been employed with Gwinnett County Public Schools for the past 17 years working in the Autism program. For 15 of those years she has worked with Spectrum volunteering with our summer camps and drama club in addition to leading our sibling group during the Thursday night meetings. 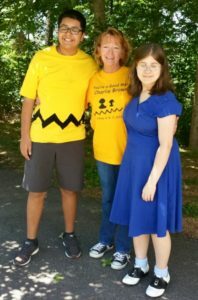 Kathy says, "I have been a part of the sibling group, watching some of these kids grow up from elementary age to high school. I feel so blessed to be a part of such a unique group of people who bring so much joy. The kids all know me as Ms. Kathy and I am very passionate about working with children on the Spectrum." Spectrum says, "Kathy is a valuable asset to Spectrum and a friendly, familiar face for all of the children and young adults attending our programs. It's wonderful to have such a long-time program leader such as Kathy and we appreciate her so much!" Thank you Kathy for your support of Spectrum!